First of all, I love De Botton as an author. He’s an artist who turns a keyboard into a palette. However, I hated this book. I don’t hate it for the reasons a Christian should hate a book called “Religion For Atheists,” in which an atheist claims to be able to go mining through Christian tradition to pluck out the pearls and leave the heavenly gates behind. I hate it because he didn’t write it well, and he didn’t think about what he was saying. The first infraction is the worst, because, having read De Botton’s The Architecture of Happiness, I know how good he is. He can turn phrases with the best of the classics of Western literature. He’s better than Oscar Wilde and could at least stand outside Albert Camus’ door. But he didn’t do it in Religion For Atheists, which feels rushed and sloppy. Be clear: it’s not sarcastic and insulting. It’s amateur. Secondly, and perhaps he’s less guilty in this case because he’s more of a literary artist than a philosopher, the book is a collection of intellectual fluff. He proposes a secular Agape meal held at a restaurant (instead of the Eucharist) in which interaction is mandatory, because this will cure racism and prejudice. He wants to hold onto Original Sin because he believes it will make everyone feel better about themselves. He thinks universities should offer classes on marriage and preparing for death to take the place of religious instruction. What he misses is that when you take out the foundation, you take out the rationale. In reference to apologizing on the Day of Atonement, he says, “We are not satisfying ourselves, we are obeying the rules.” What rulebook is the atheist using? What objective moral grounds are there for saying we should or shouldn’t have done anything? Why is there innate moral value to honesty if we all turn back into dirt anyway? All of this, and here’s the worst part, he says is “obvious,” because “of course” people know that religion is false. Fortunately, he leaves us the sufficient material for psychoanalysis, remembering a time when his father demeaned his eight year old sister until she cried for entertaining a hope in God. 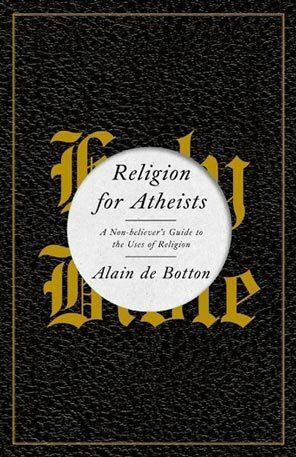 De Botton is still a kid afraid of his atheist dad, who, instead of using reason, seemed to capitalize on patronization. De Botton is a more subtle version, but again rather than reasoning, all he does here is patronize. De Botton is Nietzsche without the distemper. But why? Nietzsche thought the uberman, the genius who subsumed morality under power, was an “obvious” and “of course” too, and Nietzsche was right. This whole group therapy fantasy is completely unfeasible, because it’s moral obligation without Judgment Day. It’s an optimistic humanism that has historically proven a failure over and over again. And in De Botton’s case, it’s just a forlorn admittance that he desires things that only faith can provide. So in the end, I hope he writes something else. The only religious tradition that Religion For Atheists deserves is last rites. Thanks for your thoughts. As a Christian minister I wonder however what you thought of his observations of religious activities and the obvious benefits of them and perhaps their further development or enhancement? I was strangely refreshed by an outsider who could see the good things about a religious community life and portray them so clearly. I was also sobered by the fact that many nominal believers in churches today are probably nothing more that people like him! Even church leaders in certain denominations are much the same as him!